At Accent Bottle Lights, we specialize in just one thing- Wireless LED Wine Bottle Lights. The Grinch and sports team wine bottle lights are popular choices for men, especially the hard to buy for and ones who have everything. 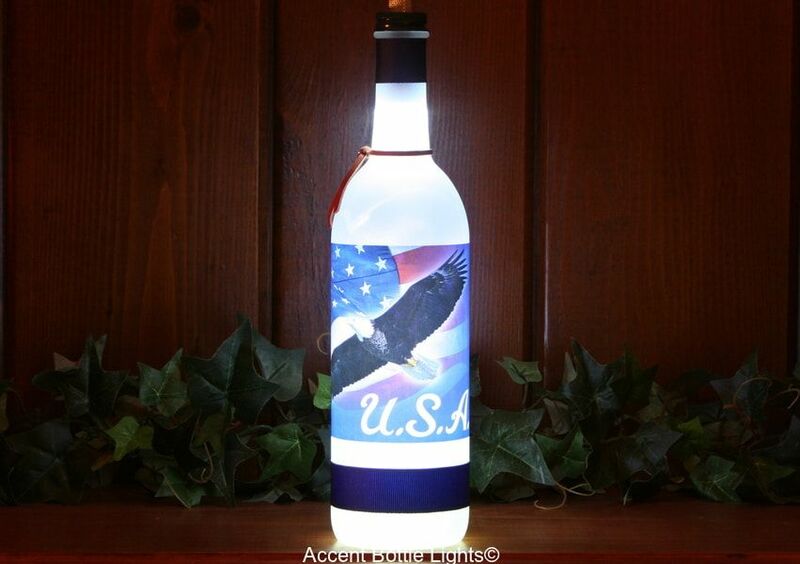 Customers who buy our wine bottle lights for men, attest their man loves it! 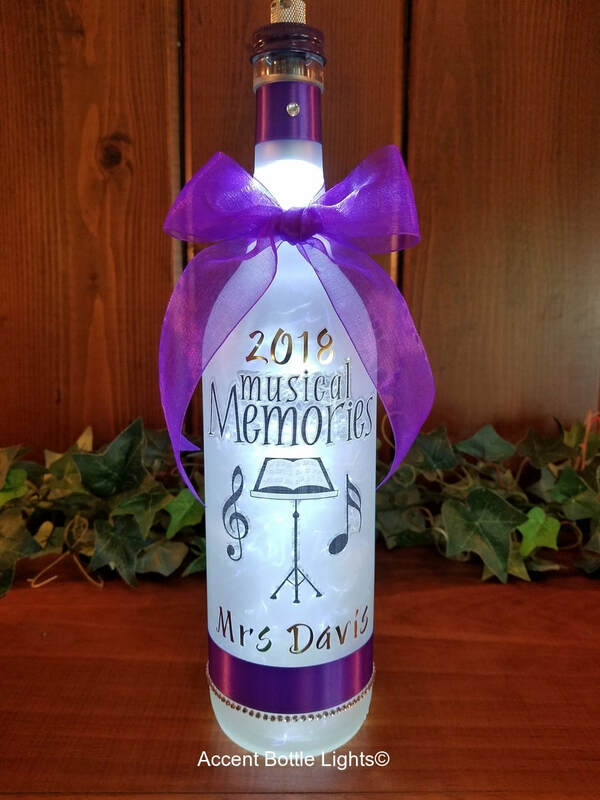 Our decorative themed wine bottle lights fit interests, come with a special greeting such as for Mother's or Father's Day, or of what they collect, such as lighthouses or butterflies. 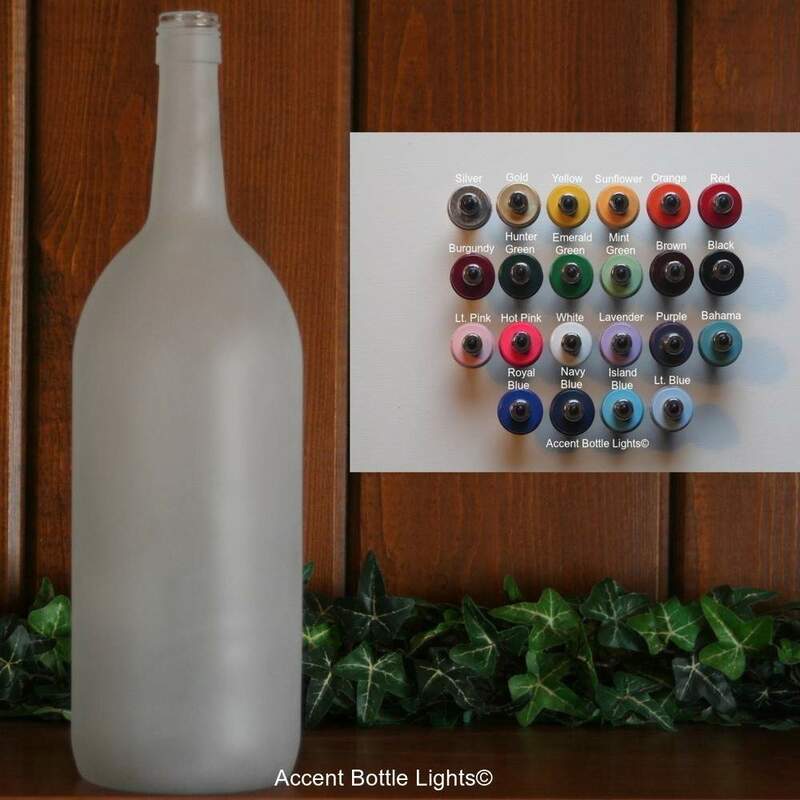 Shop with Accent Bottle Lights for a decorative wine bottle light they're sure to enjoy! where I incorporate quality and design for attractiveness and purpose. Text or call if you have any questions. The FAQ page may answer immediate questions you have about our wine bottle lights. Buy the Grinch bottle light as a gag gift for men or a 'heart felt' gift for kids. All Christmas wine bottle lights come with a bow, or choose a Christmas present charm on leather cord for boys or men. The Grinch makes an all around great gift! 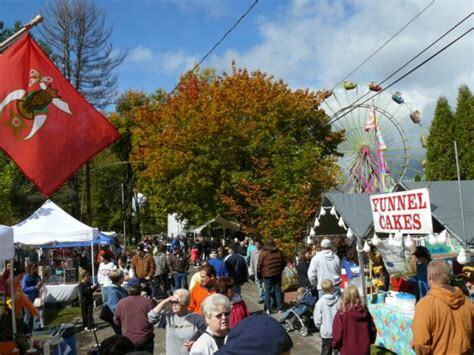 Fri. 2pm-7pm, Sat. 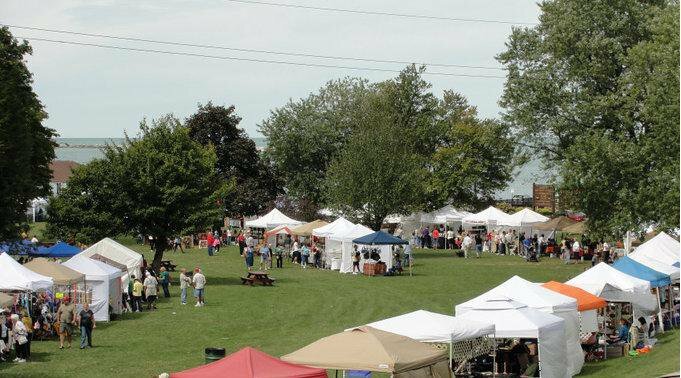 10am-7pm, and Sun. 10am-6pm. Are you an arts and crafts lover or looking for a gift for someone who is? 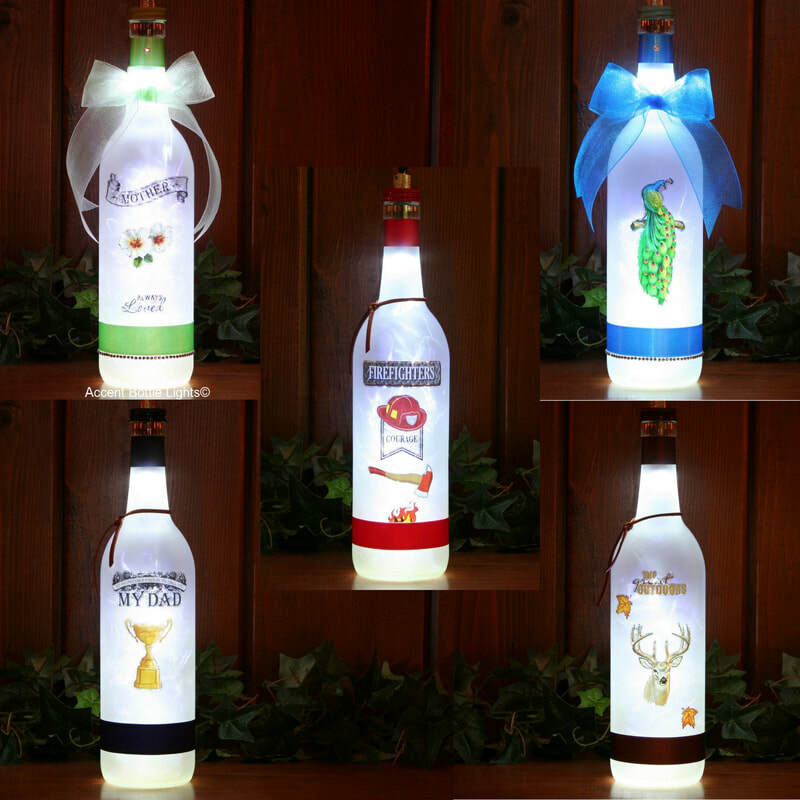 Consider a DIY bottle light kit for a fun gift to paint, decorate with decoupage tissue paper, lace, and more. If you are looking to buy lights for your own bottle, our wireless LED screw cap lights are available in 21 different cap colors. the year and her name. 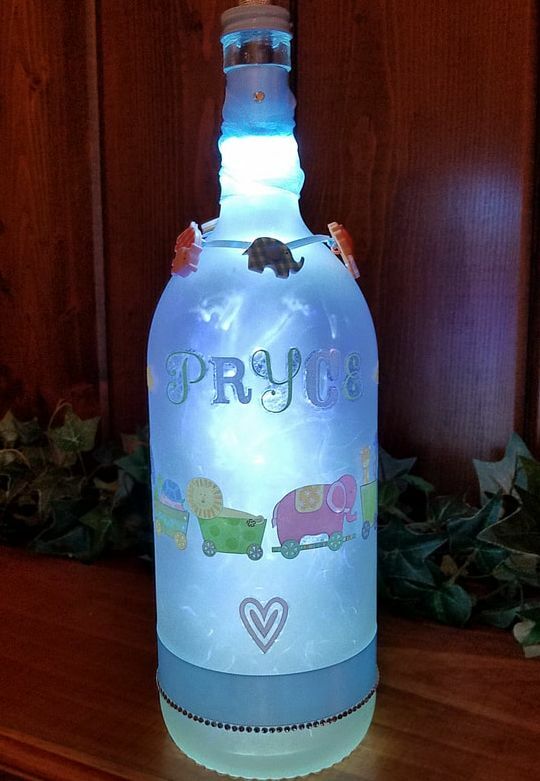 This baby boy lighted bottle was created using the large bottle that I use to make the sports team bottle lights. It is personalized with his name and a has a 5 baby animal charms on satin ribbon around the bottle neck. 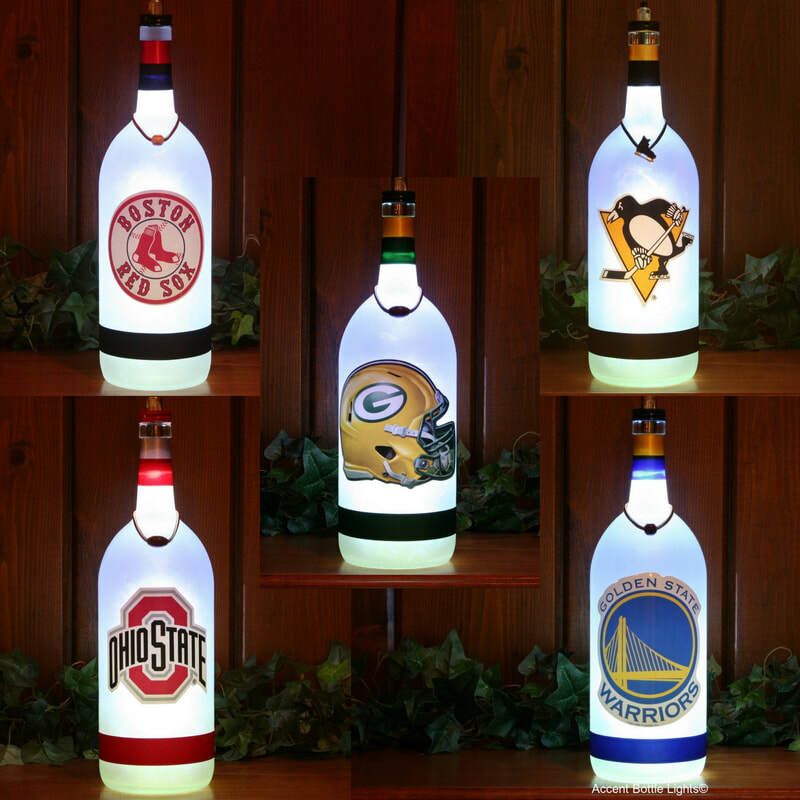 We think you'll absolutely LOVE our themed bottle lights. But don't take our word for it. Meet a few of our happy customers! I have two of these lamps and have given 2 as gifts. I love the simplicity of the designs and the light that is given off by them. LOVE LOVE LOVE Them!!! I have purchased several of the accent bottle lights from Sharon and want to say they are amazing. Sharon's work is fantastic. Working with her to purchase these lamps was awesome. Can't wait to order more. Thanks Sharon. Thank you so much for all your hard work in making these special lamps for me. I really appreciate it! Absolutely Gorgeous!!!! This is my 2nd purchase of this beauty!!! I can't express how fabulous the craftsmanship of these bottles is!!!! DO NOT hesitate to purchase these!!! They are going to make 2 people very happy for Christmas! Such a unique, gorgeous gift! You won't be sorry you bought these!!! Thank you so much for all your hard work making these bottles and thank you for packing them so securely!!! I will most definitely be back for more!!!! Amazing experience from an incredibly personable person. Easily the best customer service I've had anywhere!! I will definitely be ordering more bottles in the future! Thanks again for everything! The lamps are handmade using frosted glass wine bottles, decals, decorative materials, and wireless LED light caps. Our wine bottle lights are sure to please even the person who has everything!